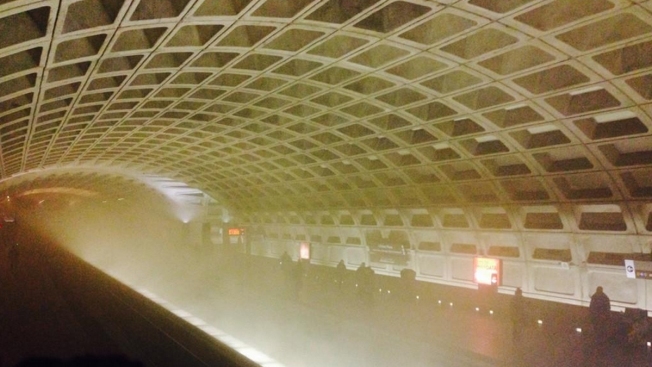 A witness' photo shows the smoke that filled the L'Enfant Plaza Metro station in January 2015. A judge says people who were inside a Metro train when it filled with smoke can't sue the District of Columbia. Local news outlets report that several riders and the family of 61-year-old Carol Glover, who was killed, sued the Washington Metropolitan Area Transit Authority and the D.C. government after the January 2015 smoke incident at L'Enfant Plaza Station. The lawsuit alleged that D.C. was negligent because first responders didn't evacuate the train quickly enough and communicated poorly with Metro staff. Metro later asked a court to dismiss legal claims against it, arguing that it has immunity from the lawsuits. It placed blame on D.C. first responders, saying D.C. fire personnel "ignored its obligations." District Judge Tanya Chutkan ruled Thursday that the riders couldn't sue the D.C. government because it's protected by "sovereign immunity" and the government agencies were responding to a high-pressure emergency situation. The judge's opinion said first responders weren't mandated to take any specific actions that day. Metro is still part of the lawsuit.